BETHESDA, Md. 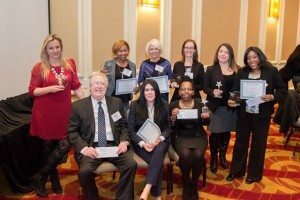 – Dec. 21, 2015 – ROSS Management Services, a leader in multifamily property management, today announced that it won a total of 15 awards from the Property Management Association (PMA). The Marketing and Advertising Excellence (MAE) Awards and Leasing Professional Awards were distributed during the PMA’s annual ceremony. PMA represents property management professionals in the Washington D.C. metro area. • Stephanie Johnson and Gregory Matthews, both of EOS-21 Apartments, tied for second place in the Virginia division. • Ann Schroeder of the Cypress Creek apartment community came in second in the Prince George County, Md., division. • Katie Thomas of the Charlestowne North apartment community finished in third place in the Prince George County, Md., division. 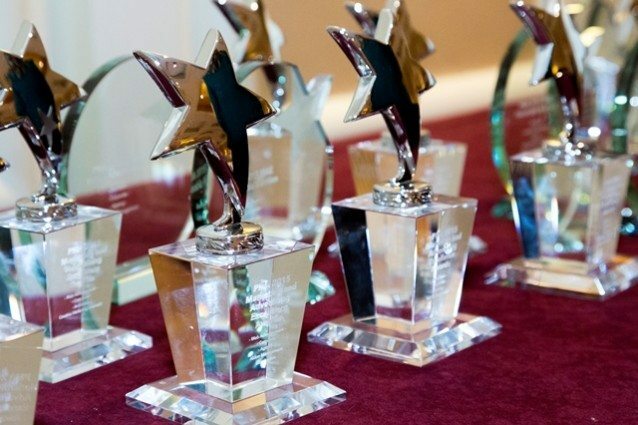 Overall, more than 80 associates were nominated for the Leasing Professional Awards, and only 16 awards were handed out. • Glenny De La Cruz of Metro 710 in Silver Spring, Md. • Khadijah Jenkins of Cypress Creek in Hyattsville, Md. • Paula Merlos of Seven Springs Apartments in College Park, Md. • Mayra Trevia of EOS-21 Apartments in Alexandria, Va.
• Tabatha Williams-Shuler of Spring Parc in Silver Spring, Md. • “We’re Driven,” a one-page ad summarizing the firm’s commitment to and success in the metro D.C. area, won first place in the Print Ads category. • An outreach ad introducing the newly renamed Cambridge Apartments at New Carrollton Station, which previously consisted of three separate communities in New Carrollton, Md., received honorable mention in the Print Ads category. • The main sign at Cambridge Apartments at New Carrollton Station won first place in the Property Signage category. • The firm’s 2014 holiday gift to corporate clients, which consisted of a Cordito wrap that carries cords and plugs, received honorable mention in the Promotional Item category. • The recently remodeled leasing center at Crestleigh Apartments in Laurel, Md., won honorable mention in the Leasing Center category. • ROSS Management Services’ materials encouraging employees to create videos for the firm’s annual employee recognition event received honorable mention in the Internal Public Relations category. ROSS Companies, founded in 1983 in Bethesda, MD, is a recognized leader in multi-family acquisitions and investment, development, property management and renovation. With a managed portfolio of more than 11,000 apartment homes in 28 communities, the privately-held company is one of the most active multifamily real estate firms in the Mid-Atlantic region. ROSS Companies is comprised of three affiliates – ROSS Development & Investment, ROSS Management Services and ROSS Renovation & Construction. In 2015, ROSS Development & Investment is celebrating its 31st anniversary and ROSS Management Services is celebrating 26 years in business. In 2015, 19 ROSS-managed apartment communities were awarded the Apartment Ratings’ 2014 Top Rated Award, reflecting ROSS Companies’ unwavering commitment to customer satisfaction. These annual awards recognize communities with outstanding resident satisfaction ratings as measured on ApartmentRatings.com. For more information about ROSS Companies, visit TheRossCompanies.com.